Unemployed construction workers have held protests at two UK power stations amid claims British employees are being denied the chance to apply for work. Around 400 people blocked the main gate at Staythorpe in Nottinghamshire, the union Unite said, and about 70 gathered at Grain Power Station in Kent. Unions say hundreds of contracts will go to non-UK employees but contractor Alstom rejects discrimination claims. Wildcat strikes ended last week after a deal on the use of foreign labour. Workers at Lindsey Oil Refinery in Lincolnshire returned to work after more than a week of walk-outs and protests involving thousands of workers at more than 20 sites. Now Unite and GMB claim 850 jobs on contracts at Staythorpe will be denied to local workers, while on the Isle of Grain in Kent, 450 jobs will be similarly affected. 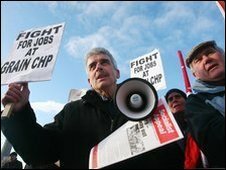 Speaking from the protest at Staythorpe, Unite's regional officer Steve Syson told the BBC he was looking for a "level playing field". He said: "There is clearly no intention of employing anyone... they've issued contracts out to non-UK overseas employees but we believe local labour is available. "We want some transparency to see what they [foreign contractors] are being paid." Power firm E.On has contracted Alstom to build a power station at Grain, where protesters claim skilled workers are being denied the chance to apply for work. They say Polish subcontractors Remak and ZRE were refusing to look at applications from UK labourers. Unite's joint general secretary Derek Simpson said: "No European worker should be barred from applying for a British job and absolutely no British worker should be barred from applying for a British job." A delegation from the union is delivering a petition to Downing Street urging Gordon Brown to insist employers give British workers fair access to work on UK engineering and construction projects. It also calls for overseas workers to be paid in line with agreed UK rates. Alstom said all workers, whether British or European, were paid the same rates and sub-contractors were entitled to select their workers. A spokesman said: "For the Staythorpe and Grain construction sites British workers will carry out two-thirds of the work from start to finish. "The claim that we discriminate against British workers is simply not true."